Sometimes the places most worth visiting require a little more effort to get there. Like Playa Nicuesa. I've taken a small 19-passenger plane 50 minutes south from San Jose, the capital city of Costa Rica, to the pancake flat coastal town of Puerto Jimenez. We disembark into the sweltering tropical heat of the near-equator and quickly jump into the air-conditioned taxi waiting to drive us five minutes to a rickety, dubious-looking boat dock. All smiles, we are greeted by our very friendly boat captain and guide, who assist our little group to clamber down the dock steps into the little panga boat â€" thankfully outfitted with a canopy roof. As we zip across the calm blue-gray waters of the Golfo Dulce (â€œSweet Gulfâ€) for our 25-minute boat ride to Playa Nicuesa â€" the only way to get there â€" I am mesmerized by the scenery. The horizon is filled with dense green forest and mountains; the Gulf stretches on and on like a giant mirror to the sky. There are no buildings to be seen, not even another boat. And I wonder if this is what Costa Rica must have looked like hundreds or even thousands of years ago. 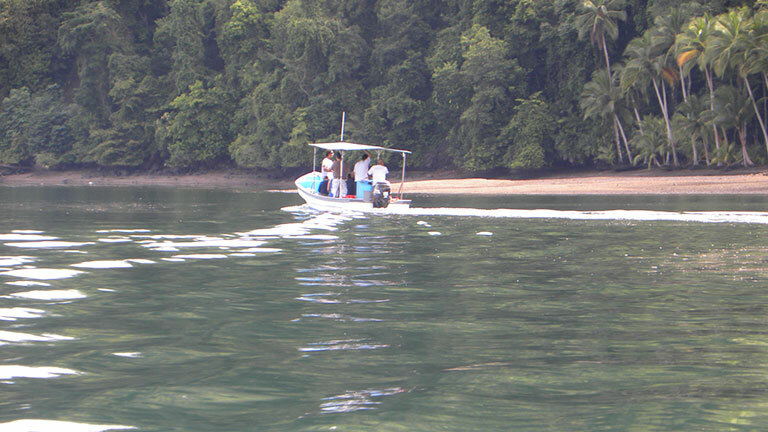 Soon, we are pulling up to the long, very solidly built boat dock at Playa Nicuesa Rainforest Lodge. Here, the clear water looks like liquid jade, reflecting the endless shades of green of palm trees and jungle that crowd the edge of the pebble and sand beach. We are helped off the boat by smiling, friendly staff, and as we walk down the dock toward shore, I nearly expect to see Ricardo Montalban of Fantasy Island come out to greet us. The extraordinary Costa Rica eco-lodge was designed for sustainable travel. Lodge buildings and bungalows are tucked into the forest, preserving the beautiful coastline. Everything is constructed from naturally fallen or farmed trees and recycled materials, like the roof tiles made from recycled plastic banana bags and other plastics. Lights and electricity come from solar panels and a biodiesel generator that burns recycled fast food oil and other vegetable oils. All water on the property is potable, being piped in from a mountain spring and filtered. The Costa Rica rainforest lodge is one of only three dozen hotels in Costa Rica that have received the highest rating in the Certification for Sustainable Tourism Program (CST). Guests are spread out around the lodge area â€" located on a 165-acre private preserve that borders the Piedras Blancas National Park â€" in six private cabins and the four-room two-story Mango Guesthouse. Beautifully built accommodations are very comfortable, and feature bathrooms with a high-walled open-air garden shower. Over the next three days at Playa Nicuesa Rainforest Lodge, I enjoyed dolphin and whale-watching to see migrating Pacific Humpback Whales that come into the pristine Golfo Dulce to give birth and breed â€" we saw a mother whale and her calf. I hiked in the rainforest on lodge trails; kayaked in the mangroves of Esquinas River; enjoyed a yoga class; sat at the beach and relaxed; swam in the warm Golfo Dulce; and had fun socializing with other guests at happy hour every night in the bar, and while savoring delicious, fresh, creative dishes from Nicuesaâ€™s commendable kitchen. Playa Nicuesa Rainforest Lodge is located by the Osa Peninsula on Golfo Dulce in southern Costa Rica. To get there, drive or fly (NatureAir or Sansa Airlines) to either Puerto Jimenez or Golfito. Nicuesa Lodge will pick you up by boat and transfer you to the lodge (about 30 minutes one-way). Included in lodge rates are all meals, boat transfers, all taxes, all meals and snacks, unlimited self-guided hikes on preserve, use of kayaks, snorkeling and fishing equipment.